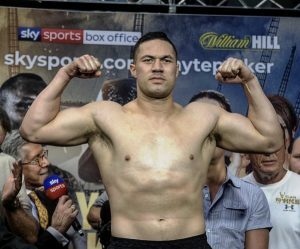 The story going into the initial announcement for Joseph Parker’s year-end bout in Christchurch, New Zealand was a long-awaited return to his home country. The opponent that has been secured for that very occasion also indicates a need for a long-awaited return to the win column. Parker’s forthcoming hometown showcase now has an official dance partner, as the former heavyweight titlist will square off with California’s Alexander Flores. The bout will headline at Horncastle Arena in Christchurch, New Zealand, marking Parker’s first home country appearance since a 12-round win over Razvan Cojanu last May. On the surface, the selection of Flores (17-1-1, 15KOs) is designed to ensure that Parker (24-2, 18KOs) enters 2019 on a high note after having suffered back-to-back losses. While there is no shame in suffering defeats to unbeaten, unified heavyweight titlist Anthony Joshua and top-rated contender Dillian Whyte, winning still goes a long way in this sport. Still, where some see an inexperienced opponent, Parker’s handlers are focused on the combination of a perceived knockout artist coming in with nothing to lose. Meanwhile, Parker’s chosen opponent couldn’t be any calmer heading into by far the biggest opportunity of his career. Flores—a 28-year old Mexican-American from California—is unbeaten in his last four starts following the aforementioned loss to Martin. He attributes the setback to the minimal time he had to train for the opportunity after accepting the fight on less than two weeks notice. Three consecutive knockout wins in Mexico has put Flores on the right track, but in Parker takes a massive leap in competition level. Still, a confident fighter is a dangerous fighter, or so goes the motivational speech in the former titlist’s training camp. Prior to the aforementioned losses to Joshua and Whyte, Parker enjoyed more than a year-long stay as an unbeaten heavyweight titlist. He first laid claim to alphabet hardware in a Dec. ’16 points win over Andy Ruiz in New Zealand, where he remained for his first title defense in outpointing Cojanu. Three straight road trips followed, all taking place in jolly old England. Parker came up aces in the first leg of the UK tour, outpointing Hughie Fury last September before conceding his belt to Joshua in their unification bout this past April. A far more bitter pill to swallow was his subsequent loss to Whyte this past July. Parker’s slow start and two suffered knockdowns proved too much to overcome, despite his late rally and dropping Whyte in the 12th and final round. Rather than dwell on two straight losses for the rest of the year, Parker was eager to get one more fight in 2018. Now that he has a confirmed opponent, a clear state of mind comes of his preparation for fight night. “I’m really glad that Alex is coming to New Zealand full of confidence,” Parker admits. “For me boxing is all about the challenge – and this is another big one. I know what is stake, I need to win and win well.